The unemployment rate is steadily improving — thank you, American people — but there's still a large pool of job seekers, and not enough positions to go around. As a result, employers can afford to be extremely picky. They're looking for qualified applicants who bring more to the table. Why can't that be you? Consider these tips to make yourself more employable. Employers can spot a cooker-cutter resume a mile away. If you don't take time to update your resume and tailor it to each specific job, don't expect employers to take time out of their schedule to interview you. This is especially true if they receive numerous customized resumes or cover letters from people willing to go above and beyond to get noticed. Carefully read job ads to understand the responsibilities and duties. When crafting your resume and cover letter, focus on skills that are a good match for each specific position. For example, if you're applying for a sales position, your resume should focus on any previous sales or marketing experience. Mention workshops or courses you've taken, sales awards or recognition you've received, duties and responsibilities, and action-oriented tasks that got results. A career coach recently told me that going back to school isn't necessary if you're trying to make yourself more employable, but it doesn't hurt to brush up on skills you already have. You can take a free or low-cost workshop, seminar, or class at a community college to expand or improve upon your skillset. Even if you have the requisite experience and education for a position, you might go further in the interview process if you have additional skills such as speaking a second language or proficiency in a new software program. The less time a company has to spend training you, the better. Additional skills also might enable you to have a greater role in the organization (and possibly move up the corporate ladder faster). Before applying for any job, research the "bonus" skills that employers in your field desire. If you can master these, you'll become more employable. On the flip side, make sure your social media profiles aren't losing you jobs. Employers are researching your online life to make sure you're a good fit for the company before they extend an offer. Drunken or controversial posts, a combative attitude, and other unsavory and unprofessional additions will only work against you. You can do every suggestion listed above, but if you have terrible interview skills, most employers aren't going to give you a second thought. By now, you're probably familiar with common interview questions like: Why should I hire you? How can you help my company succeed? What are your long-term and short-term goals? What are your strengths and weaknesses? But don't just focus on mastering responses to these questions. Learn about the company by reading press releases, news articles, or studying their financials. This proves you've done your homework, and that you have a sincere interest in the company — and it'll help you prevent looking like an idiot in the hot seat. You might go into an interview thinking you have to earn a certain salary or have a certain schedule. However, flexibility can pay off. This doesn't mean compromising and taking a job that's clearly not a fit. But if you're flexible with your desired income and work schedule, you might get a job offer sooner rather than later. An employer might be unable to offer $55,000, but can do $47,000. Or, they might be unable to offer a nine to five shift, but can hire for a later slot. 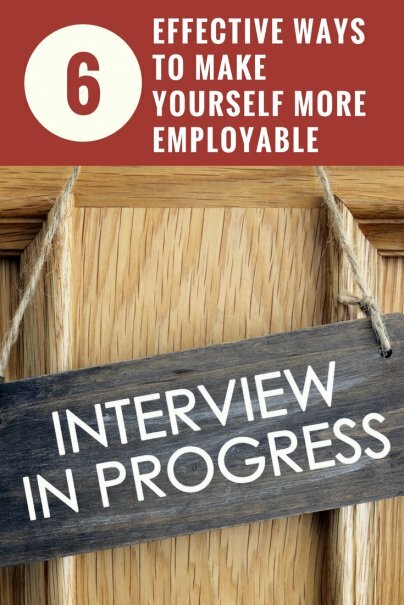 Do you have tips on how to make yourself more employable? Let me know in the comments below.